Workday: Historic Ships In Baltimore – June 2, 2018 – Chesapeake Chapter U.S.L.H.S. Rob passes up wood from the lower – lower area to Lauren and Paula for removal. We had a small crew of five on the Lightship Chesapeake in Baltimore’s Inner Harbor for our second workday there in 2018. It was no surprise that it was overcast and threatening rain all day – that seems to be the standard forecast for the last couple of weeks. The threat of rain dissuaded us from any thoughts of completing the tasks that called for painting outside. The day started out quiet but the visitor traffic picked up as the day progressed – probably a lot of people waiting for the afternoon’s baseball game between the Orioles and New York Yankees to start. 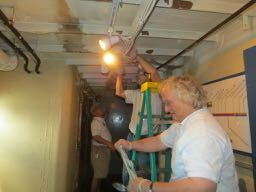 We continued work in the forward port storage room where we completed the scraping and cleaning of the benches that had been cleared on the last work day. We finished scraping the peeling paint from the corners, vacuumed up the paint chips and then returned items to the storage room. 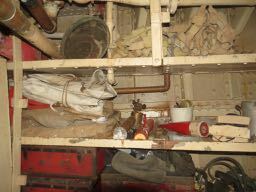 The variety of the items is very interesting ranging from hazardous substance masks, to screens for portholes, to cargo netting and more. 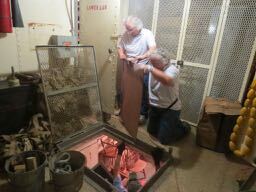 We also moved a lot of odd pieces of wood from the storage area under the one we were working on and took them to the drill press room at the other end of the ship. The storage area looked much more organized when we had finished. 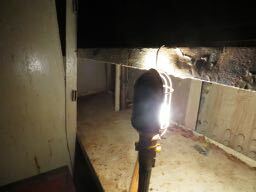 One of the other cabins was also scraped to remove a lot of the peeling paint from the ceilings and walls. There seems to be a lot of peeling paint around the ship. Rob explained some of it has to do with how cold the ship got during some of the cold snaps this winter. In the lower storage area, there is little heat, so it is worse down there. The other main task was replacing some of the electrical cable that will lead to the new electrical box for lighting the display cabinet we repainted last year (several times!) This took the entire crew to extract the old wire which was a bit stubborn and didn’t seem to want to be removed. Then stringing the new cable took some elbow grease, but by the time we left, the new cable was in place ready to be hooked up on a future work day. 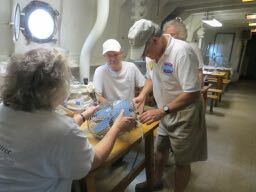 We cleaned some of the fans that are being used to cool the ship during these hot and muggy days. Greg made a quick repair to the electrical cord on one so it could be used in one of the areas where there is a lot of activity. It was cooling us off as we finished off the workday. The emergency lights were also tested as they are every workday. We also continued work on the range light. We didn’t get a coat of paint on it, but we did remove the paint that had been applied to part of the glass prisms. I’m sure we will be painting again next time around! The far corners of storage area after a thorough scraping. The storage area cleaned and restocked with “stuff” in storage. 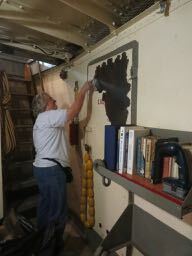 Paula scraping the peeling paint off the door in the lower storage area. Greg rewires one of the fans to provide a cooling breeze on a hot day. 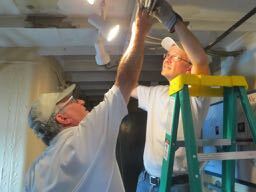 Andy and Greg replacing electrical cable. Replacing he electric cable leading to the display case is an all team effort. 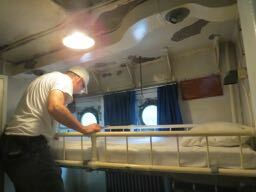 Andy cleaning one of the crews cabins in the forward area of the ship.